When you have an overwhelming amount of information to collect and present, it is best to choose the best type of document to use. 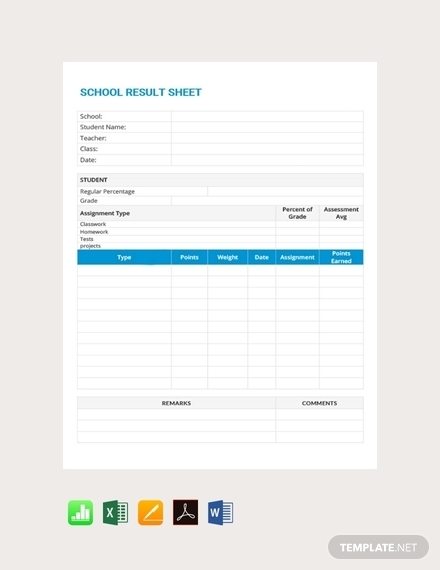 In both corporate and academic setting, a sheet is something versatile that will help in systematically organizing information and data about a particular subject. A sheet can be made specifically for a certain subject. You can tailor how it is made, number of rows and columns, customize the labels, and so on. 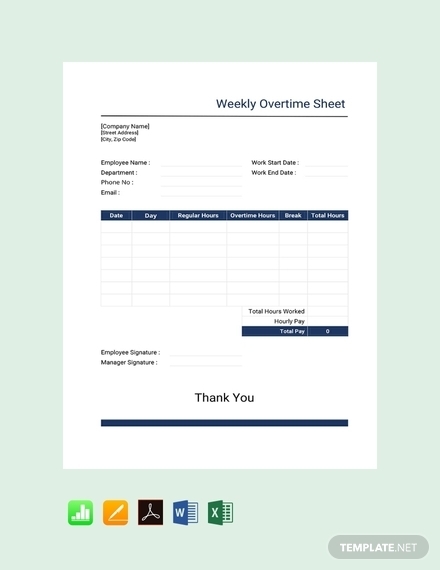 To ensure that you are able to create a sheet specifically for the purpose it will be used for, this article will give you a guide as well as examples of an effective sheet. 1. 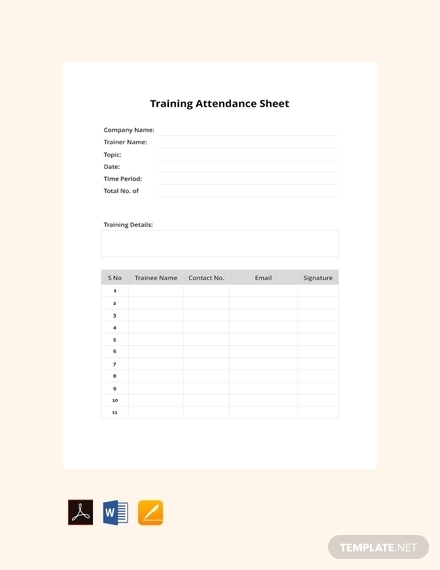 Heading or Letterhead: Regardless of the purpose and setting wherein a sheet will be used, it is important to provide an indication who made the sheet. This means that you need to provide a heading or, better yet, a letterhead that will provide all the pertinent information about the writer. It should contain the name of the company or organization, the specific department of office it is from, the company address, and the company logo. 2. 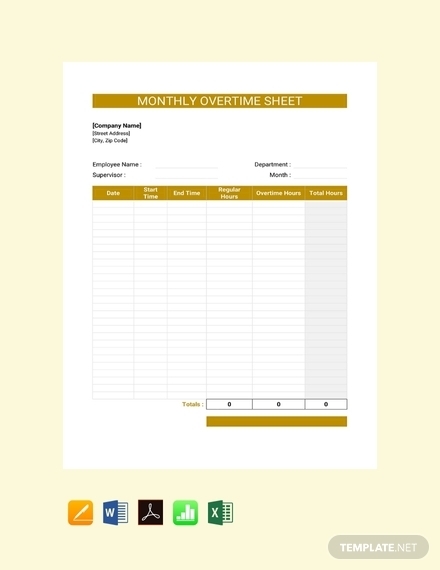 Sheet Title: As mentioned, a sheet can be used for anything, that is why there is a need to provide for the title that will describe the specific purpose of the sheet. 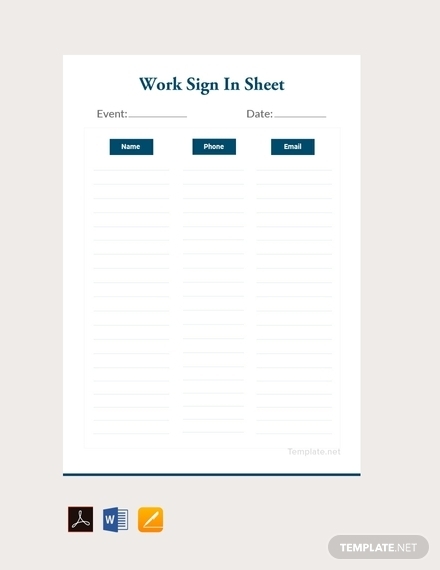 For example, a sheet entitled Staff Sign-In Sheet will tell the readers that it encompasses the name, time, and signature of each staff member as they sign in for work. Providing a direct and clear title allows the individuals about to use or refer to it to easily understand its purpose. 3. Rows and Columns: Since a sheet can contain quite a few categories about a single subject, there is a need to separate each category to make the sheet easily comprehensible. 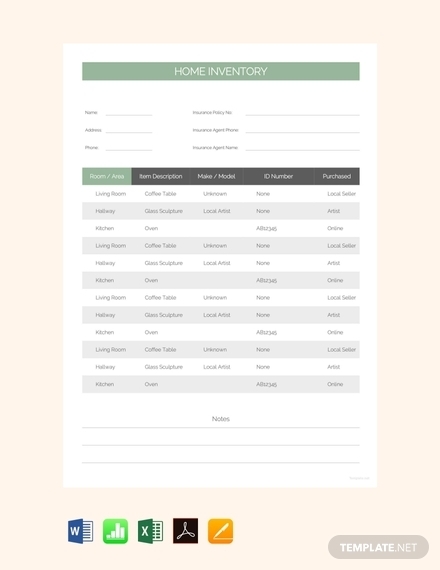 You can use a table that will allow you to include as much rows and columns that you need to make sure you are able to gather all the data that you need. 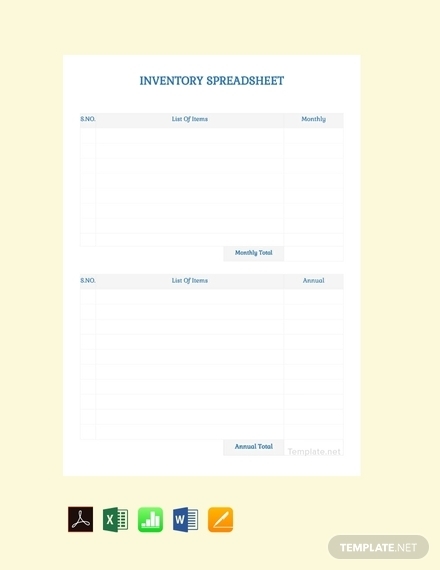 Having enough rows and columns will help you organize your data that you can easily review and present, if needed. 4. Labels: Since you are utilizing rows and columns to separate categories and/or types you need to properly indicate where they should be placed or written. Thus, it is important to appropriately label the words and column/s in your table so that writers and readers know where to write and find specific information relating to the subject. You may also see data sheets. 5. Entries or Items: The entries or items indicated on the sheet are important since it will be the basis for computations, analysis, and so on. 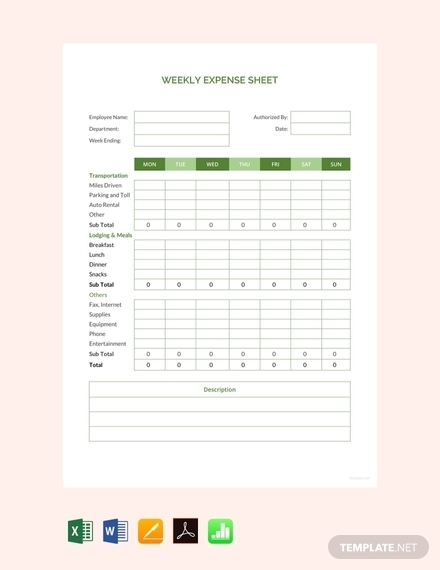 For example, the entries in an expense sheet will help you identify what made you go way over your budget or the other way around. It is important for the entries or items on your sheet to be accurate and precises; otherwise, your computations or analysis as well as presentation of data will be compromised. 6. Signature Line: In most cases, you are making a sheet because you are tasked to do so by a higher-up such your immediate head or supervisor. That means that before you submit the sheet, you need to let your higher-up affix his/her signature first to vouch for the accuracy of the data it presents. Also check out client information sheet. 1. Write heading or letterhead: As mentioned, it is important to provide pertinent information of the source of the sheet so that there is accountability with the information shared on it and it can be easily traced back to its original source. Therefore, you should provide a heading or a complete letterhead on the topmost part of the sheet. 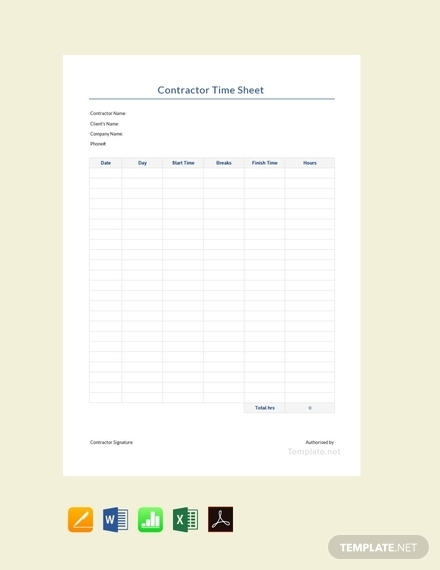 To do this, immediately proceed to typing out the details such as company or organization name, address and contact information; then, make sure that these details are aligned on the center of the page. You can also go to the Insert tab then click Header where you can choose the style or format you want your letterhead. 2. 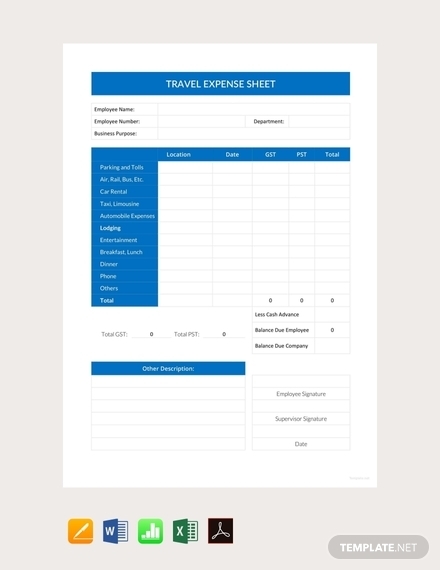 Indicate sheet title: A few spaces below the heading or letterhead, you should immediately indicate the title for the sheet. The title will directly tell the reader what the sheet is used for and what all the included information or data relates to. 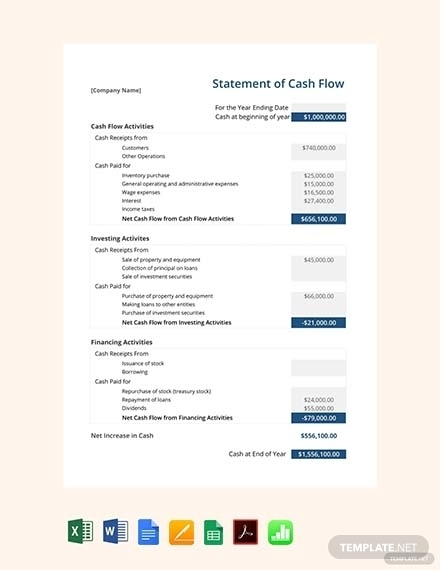 You can immediately proceed to typing out the title for the sheet; for example, Fund Fact Sheet on the center of the page. Remember to keep the title as succinct and direct as possible. 3. 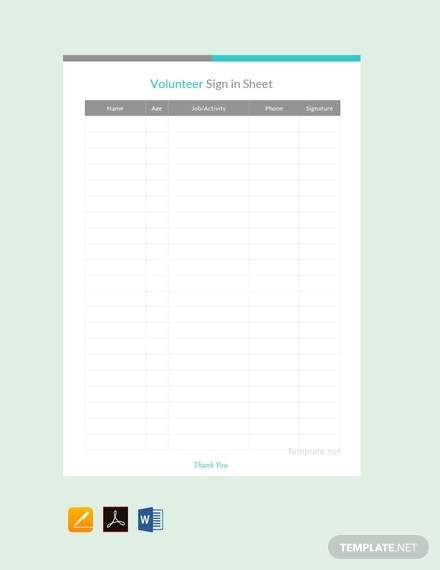 Insert table: Since you will be needing rows and columns where you can systematically separate the contents you are about to write on the sheet, you need to insert a table. To do this, go to the Insert tab, then click the Table option. There, a drop-down of options will appear, one will be an illustration as to how many rows and columns you can insert. You can highlight the number of rows and columns that you need and it will immediately appear on the page. Another thing you can do is to choose the Insert Table option on the same drop-down so you can manually input the number of rows and columns you need. Once the table is inserted, make sure to adjust the width and height for the rows and columns so that your texts can fit. 4. Indicate labels: After you have inserted the table and adjusted the rows and columns, you should indicate the labels for the rows and column/s. 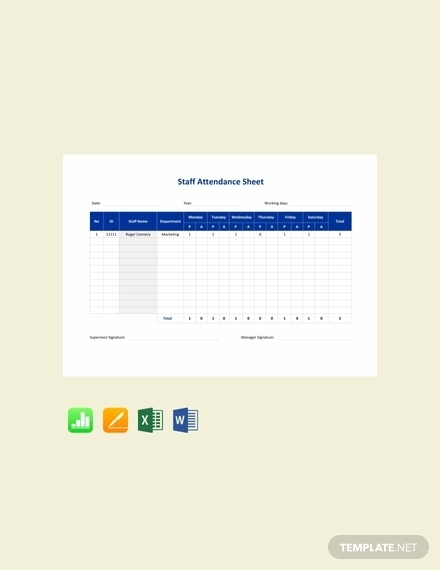 The labels will allow you to logically separate the information and data on the sheet. For example, in a grade sheet you should indicate where to put the grade for different criteria or grading period and where to input the average; this way will be a clear view as to how the average was derived to avoid confusion on the writer as well as the readers. 5. 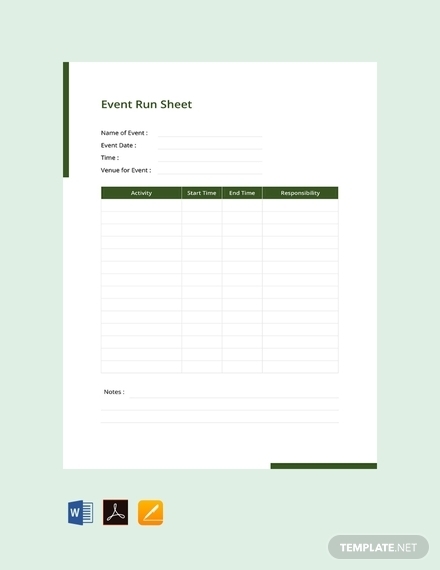 Write entries or items: Since you now know where to out specific information or data, you can proceed to writing the entries or items that relate to the purpose of the sheet. In most cases, a sheet can contain a majority of consolidated numerical entries and abbreviations that relate to the other contents of the sheet; thus, it is important to make sure that all of the data you include are accurate and true. 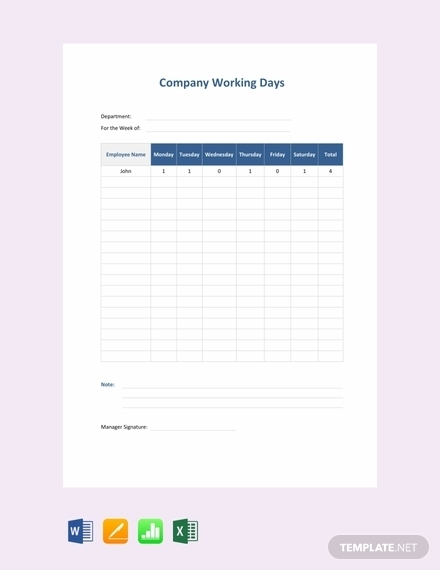 In a sign-in sheet you can easily understand that each time indicated are the times a person has signed in for work, seminar, gatherings, etc., and you can easily understand the organization of each time since it’s organized from earliest to latest. 6. 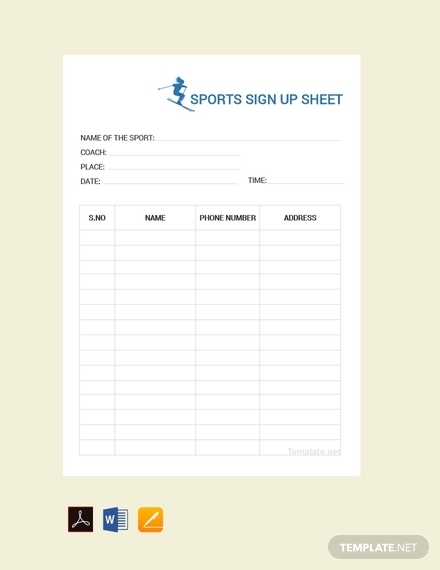 Provide signature line: Sheets used in a corporate or professional setting need approval from higher-ups before they are distributed to other members of the company or organization. Thus, it is important to include a signature line where a higher-up or immediate head such as the team leader, manager, supervisor, etc. can affix his/her signature to vouch for the accuracy and correctness of all the data that is presented. The signature line should indicate the name of the signer along with his/her position or designation in the company or organization. It should also have a line above the name where he/she can affix the signature. 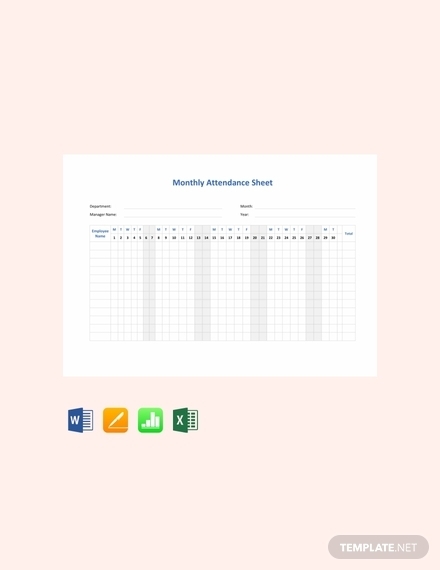 Using Microsoft Excel in making any sheet to present data is more convenient since it already provides a complete grid or rows and columns that you will be needing. You will skip almost half of the steps in making a sheet in Microsoft Word. 1. 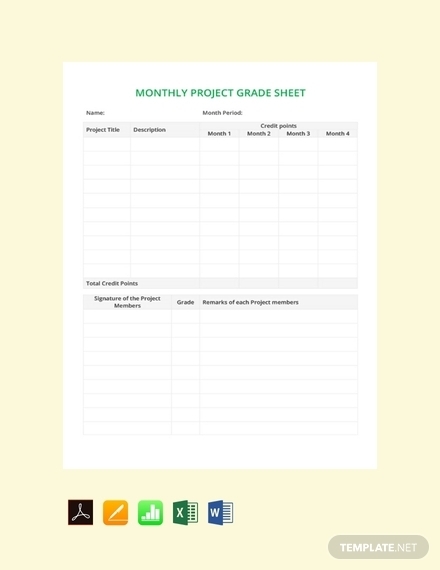 Excel has a couple of worksheets already available, choose which worksheet you will be using. 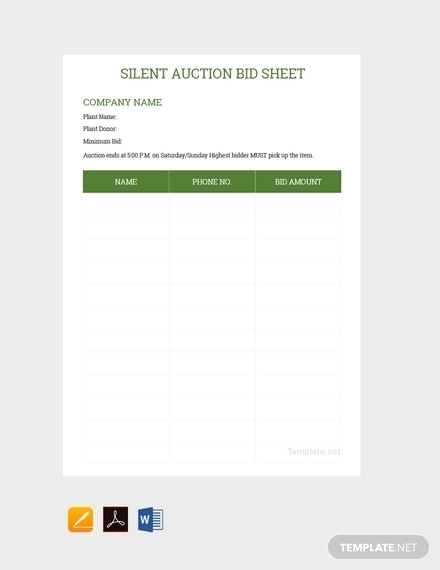 To write the letterhead for the sheet, go to the Insert tab, then click Header & Footer in the text group. 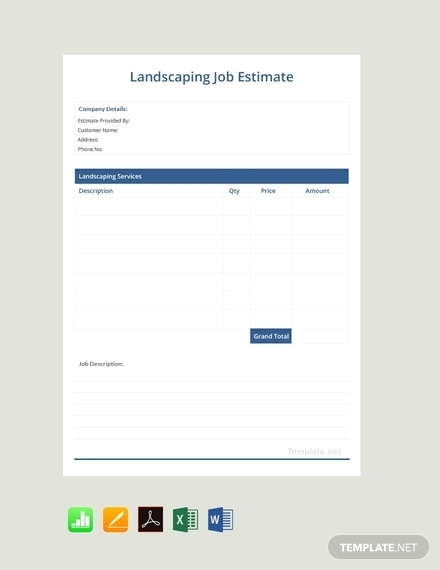 You can then add a few spaces below the letterhead to immediately add the title of the sheet. 2. Since there is no need to insert a table, you can then immediately add the labels for each rows and columns you will be using as indicators. Make sure the labels are clear and direct. 3. After that, write the entries of items on the sheet. Follow the indication on where to write specific data based on the labels. Make sure your entries are correct and accurate as it can affect your overall result or presentation. You may also see score sheet examples. 4. Lastly, indicate a signature line below your sheet. To insert a signature line, go to the Insert tab, and click the Signature Line list. Then, click Microsoft Office Signature Line. In the Signature Setup dialog box, type information that will appear beneath the signature line such as the signer’s name and position. Choose the best software to use; choose what is more efficient and convenient for you. Highlight specific labels or data on the sheet to make it more comprehensible. Indicating a legend as to what items on sheet means will make it easier to read and interpret. Maximize the space; adjust height and width the rows and columns. A sheet can be in any size depending on what is required. The most commonly used size is the standard 8.5″ × 11″. However, there are also instances where a special paper will be used so that a continuous presentation of data is achieved. In this sense, a continuous paper 2 ply (9.5″ × 11″) is used, but there are also other continuous paper sizes available.